ARAD highly believes and values quality workmanship. 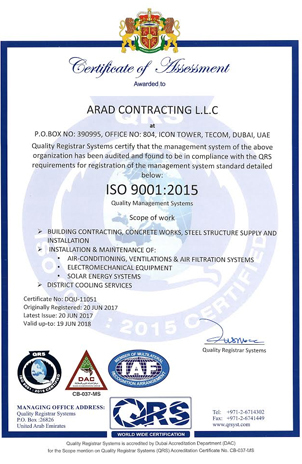 Quality work is the corner stone upon which ARAD stands and is the basis for all its operations. Its main target is to deliver the work to quality from first attempt discarding the need for repeated come backs and reattempts. “One call does it all “. ARAD values customer satisfaction and continuously interacts and interfaces with clients to take advice, receive directions and in return serve the client to his expectation and satisfaction. 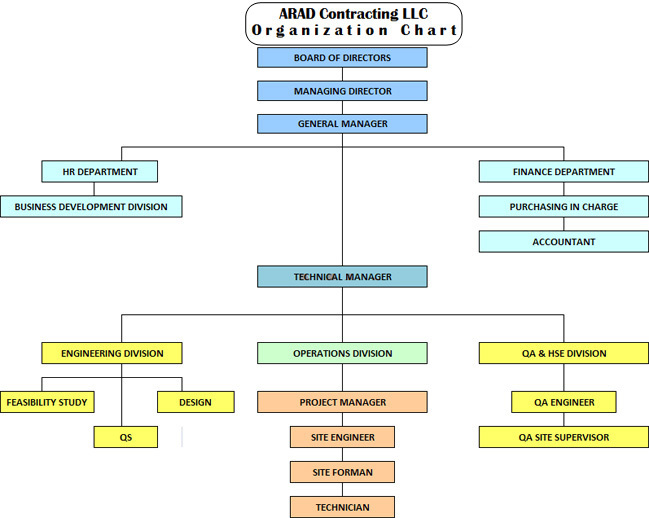 It is through the happy and well satisfied clients that will successfully expand the company. 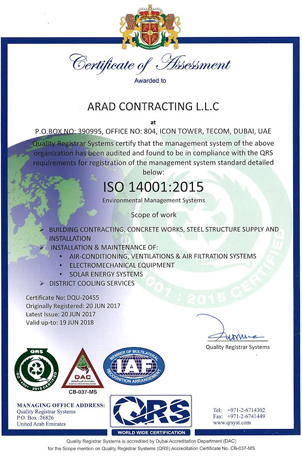 Health and safety of its employees, work place and protecting the environment is where ARAD will pay utmost attention and compliance. The company will investigate job risks to employees and provide measures to mitigate, isolate or eliminate these risks. Instead of cleaning the environment after polluting it, ARAD takes the issue from initial stages by preventing and avoiding or isolating pollution risks to the environment through sound preventative measures. At the top of ARAD’s goal list is to maintain our partnership with our clients, gaining the clients satisfaction and expanding operations into new markets in Middle East and Asia. Our goal is also to maintain qualified, experienced, competent and committed staff capable of responding to complex needs of projects through knowledge of regulatory codes of practice and international specifications. Completing project to approved budget. Ensures that all employees are aware of the requirements of the quality policy and are directed to adhere to the quality policy principles. Effective skills of management and review of training needs to bring improvements to its operational efficiencies to achieve customer and employees satisfaction. The management of ARAD considers health and safety as one of its highest priorities at work and on sites, ensuring that all employees including subcontractors working for the company adhere to health and safety regulations and conditions. Health and Safety is not negotiable for the company and it will take strong measures against those not complying with the requirements. The aim is to eliminate, isolate or mitigate risk of injury or harm to the employees and reduce unnecessary losses and liability. The company actively communicates with its employees to commit site staff to adhere to safe behavior and actively participate in training sessions, The company attends Municipalities health and safety workshops and seminars to continuously communicate and know the requirements and conditions applied. The company through its management and staff are committed to minimizing waste, emissions and recycling of material as much as possible. It utilizes methods, material and equipment which are likely to produce minimum impact on the environment (directly or indirectly). It is committed to using alternative materials and less environmentally harmful products, in compliance with statutory requirements with continued improvements and prevention that is in line with economic development and sustainability of the natural environment. Every individual working on site has an obligation to environmental protection and sustainable development. Management will always pursue with employees, subcontractors and suppliers their responsibility for the protection of the environment and the need to be alert to potential sources of pollution in the work environment. The company is committed to providing its employees, subcontractors, suppliers and clients relevant environmental information to enable them to understand the potential effects of the company's operations and identify and respond to local community concerns.